Sunflower mine is a mercury mine located in the Mazatzal Mountains and the Mazatzal Wilderness. Sunflower mine, also known as the National Mine, is the namesake for the Sunflower Mining District in which it sits. The mine is accessed only via the often rough and boulder-strewn Sunflower Mine trail. The first six claims on Sunflower were discovered in October 1911. They were discovered by E.H. Bowman of Phoenix. Bowman was looking for gold but happened upon cinnabar (used to make mercury) and malachite instead. The claims as well as nine others in the area were purchased by the Sunflower Cinnabar Mining Company for $10,000 in 1913. From 1913 to 1965, it is estimated that the mine produced 3,973 flasks of mercury, 2,140 pounds of copper, 764 ounces of gold, and 1095 ounces of silver. All of the ore was processed on site. The cinnabar ore was broken down into fine particles and then ran through a series of U-shaped pipes. After becoming a gas, the ore was cooled and then liquefied to become mercury. The mine had 3 major adits or shafts which are located further back in the mountain. What the site looked like prior to the Sunflower Fire that destroyed most structures. 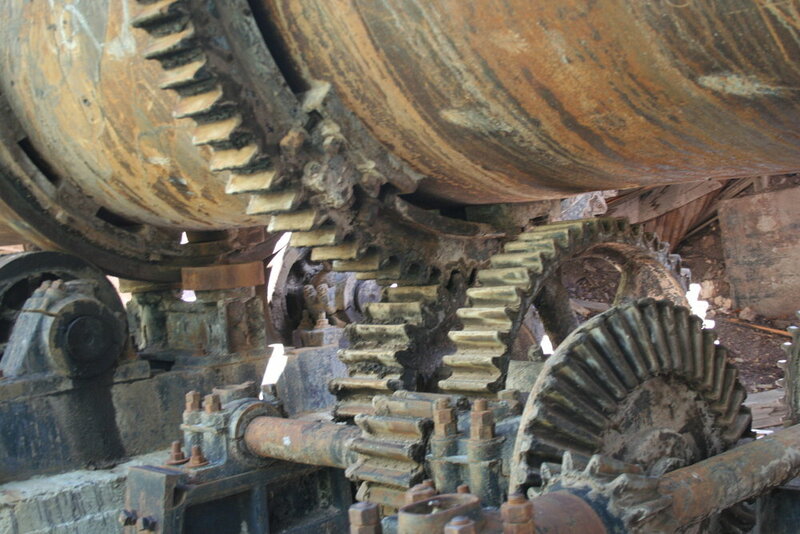 The mine was operated until 1982, however, most of the production in the area ended in 1955. Other notable mercury mines in the area include the Pine Mountain mine to the northeast, as well as the Ord and Rattlesnake mines. In a survey in the mid-1960s, 96% of Arizona’s Mercury Production had come from the Sunflower Mining District. After being totally abandoned by the mid-1980s, this area to the south was used by the Viper Militia who blew up a bridge over a deep chasm while experimenting with explosives. The bridge was later repaired using funds from the Arizona State Parks: OHV fund. With an interesting and mostly undocumented history, this place is – or at least was – a great place to explore. After the Sunflower Fire of 2012, most of this area was burned, to what extent, we are unsure. Many if not all of the structures may have been destroyed by the fire. Current roads are also affected by forest closures. Check with the U.S. Forest Service for possible updates. For pictures and information on the fire, visit IH8MUD.COM. "Sunflower Mine - Arizona - IronMiners.com." Sunflower Mine - Arizona - IronMiners.com. N.p., n.d. Web. 24 July 2013. <http://www.ironminers.com/mine-history/sunflower-mine/index.htm>. Ehrhardt, Tim. "Payson Roundup | Payson, AZ." Sunflower Mine. N.p., 20 Apr. 2011. Web. 24 July 2013. <http://www.paysonroundup.com/news/2011/apr/20/sunflower-mine/>. Ehrhardt, Tim. "Payson Roundup | Payson, AZ." Another Look at Some Sunflower Mining History. N.p., 6 June 2012. Web. 24 July 2013. <http://www.paysonroundup.com/news/2012/jun/06/another-look-some-sunflower-mining-history/>. "Sunflower - Arizona Ghost Town." Sunflower - Arizona Ghost Town. N.p., n.d. Web. 24 July 2013. <http://www.ghosttowns.com/states/az/sunflower.html>. "Sunflower District (Mazatzal Mountains District; Quicksilver District), Mazatzal Mts, Maricopa Co., Arizona, USA." Sunflower District (Mazatzal Mountains District; Quicksilver District), Mazatzal Mts, Maricopa Co., Arizona, USA. N.p., n.d. Web. 24 July 2013. <http://www.mindat.org/loc-56999.html>. "Sunflower Mine (Sunflower Group of Claims; Arizona Sunflower Group; National Group), Maricopa County Belt, Sunflower District (Mazatzal Mountains District; Quicksilver District), Mazatzal Mts, Maricopa Co., Arizona, USA." Sunflower Mine (Sunflower Group of Claims; Arizona Sunflower Group; National Group), Maricopa County Belt, Sunflower District (Mazatzal Mountains District; Quicksilver District), Mazatzal Mts, Maricopa Co., Arizona, USA. N.p., n.d. Web. 24 July 2013. <http://www.mindat.org/loc-55662.html>.